We are a Texas-based company that specializes in Texas divorce forms. Don't settle for divorce forms prepared by an out-of-state provider who isn't as knowledgeable in the requirements and intricacies of divorces in Texas. When you're ready for a divorce, you don't have to pay a lawyer to get the job done. We put you in control of the process with personalized divorce forms and step-by-step instructions. For just a low flat-fee you can buy our customized divorce kit and get a fresh start on life. Getting started is easy. Just answer a few online questions about your marriage and desired terms of your divorce. We will then incorporate your information into personalized divorce documents. All you have to do is print, sign and file. We charge a flat fee of $299 for uncontested Texas divorce forms that include all of the necessary forms and step-by-step instructions on how to use them. Unlike the other uncontested divorce form companies, we DO NOT surprise you with extra charges for adding children, editing, shipping, mailing, downloading, etc. What you see is what you get with our advertised price. A typical lawyer for divorces in Texas charges about $300 PER HOUR! Our forms cost less than a one-hour consultation with a divorce lawyer. If you need a divorce in Texas, you can save thousands of dollars by using our divorce forms. We provide an easy-to-use, quick, and economical online method for generating custom/personalized divorce forms that are ready to sign and file. Our simple online divorce solution makes your divorce less expensive and less stressful for you and your spouse. 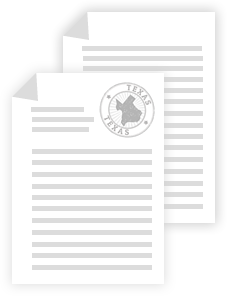 Your personalized Texas divorce forms are available immediately upon completion of a quick and simple online questionnaire. You simply download your Texas divorce kit in Microsoft® Word or PDF format, then sign and file. Unlike some of our competitors, we do NOT force you to fill in the blanks. We even include instructions on how, when, and where to file your customized Texas divorce forms. Our Texas Two-Step Divorce™ process makes filing for divorce easy. Step one is filing the divorce and step two is obtaining the divorce decree. Each step includes specifically tailored instructions that make our Texas Two-Step Divorce™ process simple.